Notice the sign says Children Welcome. It's a good thing cause the two of us were there. Also note we are both wearing long sleeve shirts. You get used to doing that out here when riding to protect yourself from the sun. The magazine articles I have read on this place say there are always hundreds of bikes. I could count them all on my fingers. 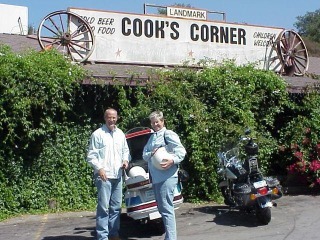 Cook's corner is a well known biker hang out. It was started back in the 30's as a place in the middle of nowhere for the local farmers and guys from the military base to go hang out and get crazy. There was nothing around so it was OK. Today as everything keeps growing there are housing developments getting closer and closer. 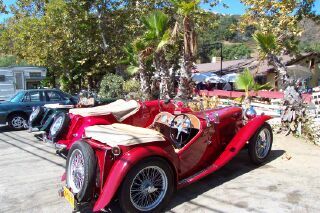 Even though today it is know as a biker hangout there were more cars there today then bikes. 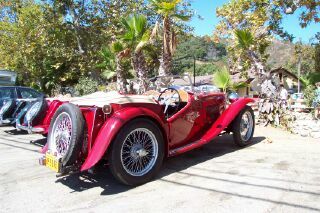 This was a Southern California MG club. I didn't take many picture on this ride. Here is what I found on the internet about the place. 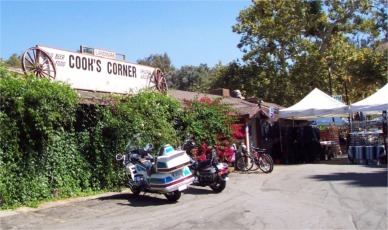 Cooks Corner, Orange County's most famous weekend biker hangout. On weekends the motorcycles are parked 10-deep in places as visitors and regulars vie for space. "Bikers" are not always what they used to be. You see plenty of folks with Harley Davidson motorcycles, but now you may also see "bikers" who are actually yuppies with expensive name-brand machines and designer, color-coordinated leathers. People come to Cook's Corner for the natural canyon ambience. Inside this little cafe is a place to shoot pool, order a basket of fries with a pitcher of brew, and listen to live music every evening (usually country western). Cook's Corner has been operating continuously since 1937.